My life Is Rooted with Faith, Rooted with Truth. Rooted With Grace. Empowering people to take charge of their life. Encouraging people to study and act with knowledge. Teaching people they can do hard things, via new yoga poses, language, and personal strength. I am now a Certified Iyengar Yoga Teacher. As my husband asked me so nicely asked me, so what? Well that is a great question. Becoming Certified means I can actually call myself an Iyengar Certified Teacher and use their Logo. It comes with great pride, and validates who I am as a teacher. But where do I go from here? What I really want to be able to do is teach Prenatal Yoga and ASL Yoga, with the understanding that I would become an ASL Interpreter, or work within the Deaf Community. I really like the idea of helping families know, understand and choose educational goals that will help their children succeed. I would like to see Iyengar Yoga visible within in the Deaf community, make ASL yoga videos to put on YouTube, my website, and on my blog. Iyengar Yoga is such a powerful tool to heal the body and mind that it is not just a work out. Although I did lose all of my baby weight doing solely Iyengar Yoga, it is not an easy work out. Introducing, "The Red King". by Great Aunt Mabel Hutchinson. The perfect size for my small house. It is a carpentry sculpture made in 1963 that she created from scraps of wood, like the picture of her working on a piece below. She made all sorts of furniture and one of her Doors, done in this fashion was even in an International Door Exhibit in Europe. The last month my mom and dad emptied out my grandma Barbara's storage shed in Tehachapi. It was like a treasure chest. Furniture from the 50's-70's, artwork, books, and family heirlooms. 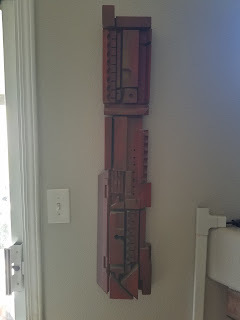 This sculpture/ totem was hidden away and I was fortunate enough to receive it. So I have resulted in carrying oils in my purse, and this weekend could have used more. We went to the BYU football game, beautiful day, but a bit more sunny than I was prepared for. I was thinking it would be cold, so I did not think of sunblock. My whole family got a bit burned. I wanted my lavender oil. The one major oil that I usually keep with me I did not have. Lavender helps heal burns, it would have kept the sting off of the sun burn for the kids. So that is the next oil to go in my bag. I also got nausea on the drive back from Utah, happily I had peppermint in my bag- which was my saving grace during my assessment. Before my Utah trip I got a cold, so I used my thieves spray and my RC to get rid of my cold ASAP. It always amazes me how quickly I can get over a cold when I pair the two up. Thieves cuts through the mucus in my throat, and RC clears up the sinuses. After 5 years of teaching and studying I had my assessment this weekend. Brandon and I dropped Daniel off at school at the other kids at my sister's house for part at the day and then they spend the weekend at Grandma and Grandpa's. Happily I got to the LA Iyengar Institute early and was able to relax and have time to stretch a little before everything started. That was when I noticed I was getting a headache. Happily I had some peppermint on me. Our assessors arrived, and the assessor in training, was a teacher I met when I was in Ohio. It was such a wonderful experience to see a friendly face, even though I knew she was not assessing me. We went over what the next 5 hours would be and how the next day teaching would go, 6 hours total.